Its like Monopoly on steroids. Learn Real Estate strategies without spending money. Come join us for a free, fun, and entertaining evening of playing Rich Dad Robert Kiosaki's Cashflow 101 board game. 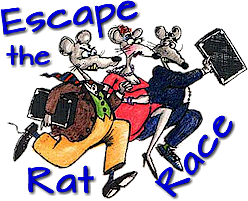 Learn how to get out of the Rat Race and onto the Fast Track where your money works hard for you, instead of you working hard for your money. Cashflow 101 is an educational board game that teaches all the principles that you need as a real estate investor and entrepreneur. You get to practice real world investing with play money, so there's no real-world risk, but there's a TON of real-world learning. Meet new people, make friends, and learn how to make smart financial decisions so that you can get out of the Rat Race for good. This board game brings out your investment style and shows you how to think and act like a successful real estate investor. It's been called Monopoly on steroids. Business owners, entrepreneurs, real estate professionals, investors and those who want to enjoy learning in a fun, and interactive atmosphere are all welcome! Please Pre-Register so we have enough boards for everyone!